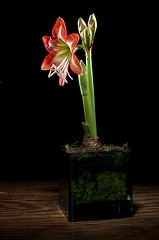 It’s time to start watering an amaryllis bulb. These frigid days and deep dark nights create a longing for a few of those startling, extravagant blooms; they’re beautiful reminders that life is lurking dormant in the earth, waiting to burst upon us when the conditions are favorable. Or perhaps, even when they are not. A few years ago, a friend gave me an amaryllis bulb, which I dutifully watered throughout an icy January and early February, until three lush, luminous flowers emerged to defy the winter chill for a few weeks. According to instructions, I then placed the exhausted plant on its side on a shelf in my dark, semi-subterranean garage, where I promptly ignored it for over two years. It just lay there, neglected and forgotten. Toward the end of this past rainy summer, I was inspired to clean my garage one day. The timing was serendipitous, which is to say, pure grace and gift. Buried under a mountain of recyclables and discarded boxes was an amazing sight: the amaryllis in full, showy bloom, surrounded by nearly-white foliage. After a few days in the sun, the leaves turned bright green, and three more healthy, gigantic flowers emerged from the now-thriving plant. Life has surfaced multiple metaphorical possibilities since then: the isolated individual who thrives and flourishes with just that little bit of encouragement, the growth that is possible in the midst of great personal darkness and drought, the sheer tenacity and exuberance of life, its capacity to endure and triumph even under the harshest conditions. It’s highly probable that each of us is personally acquainted with an ‘amaryllis’ like mine, someone thirsting for even the slightest bit of encouragement to rain down on them, awaiting the generative sun of our attention and affirmation. Consider planting a bulb for your own joy, nurture it, watch it grow, and then live the metaphor. Water and shine on the life of another, and see the beauty bloom. maintain a decent life-style…I feel for those who don’t have the means to have that. The cold weather is a challenge for people from all walks of life….and somehow it is a unifier – a reminder of the universal struggle….and when the weather warms up – it is a reminder of how blessed we are…..
No great thoughts written here – I just wanted to check in with Just Listening – because it has been too long a silence……thanks for listening…..
See, according to one view, the amaryllis survived 2 years of ‘neglect’ and was still in bloom despite it. According to another view, perhaps its because it was left alone for two years, is why it bloomed. The first is a tale of survival against all odds. The second reminds us that sometimes we need to leave things, give some space, for life to take its course. Guess what, if we take the middle ground we’ll summise that a little bit of both is what makes this life so special.